Covers Eastfield, Convent of Mercy, Horfield Common, Henleaze, holy Trinity Church and Royal School for the Blind. incl Sneyd Park, Rockleaze, Downleaze, Seamills stn; also part of Portishead rly on Somerset bank. Covers Brandon Hill, Clifton College, Queen Elizabeth's Hospital, Bristol Bridge, Clifton Down Station, Tyndale PArk and St George's Church. Covers part of Mangotsfield, Downend Farm, Clevehill, Overnhill House, Christ Church and Blackhorse. Covers Ridgeway Park Cemetery, Mayfield Park, Chester Park, Railway Station, Upper Eastville, Clay Hill and Atlas Locomotive Works. Covers Railway Station, Upper Soundwell, Lower Soundwell, Reservoir, Cockshot Hill, Reservoir and Rodwayhill House. 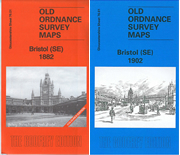 Covers Lnatern Bottom, Cockroad Bottom, Potters Wood, Holy Trinity Church, Kingswood Reformatory and Warmley Hill. Covers Siston Common, Webb's Heath, Bridge Yate, Crown Farm, Railway Station, White Hart Public House, St Barnabas's Church and Oaklodge Farm. Village on SW of Bristol; also incl South Liberty Colliery. 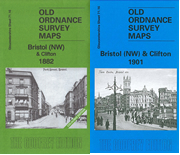 Covers West Town, St Martin's Church, Queen's Dale Farm, Kensington Park, Lower Knowle Farm.